The new Perminator relies heavily on users uploading scans of annual waivers and ride results (cards, receipts). Volunteers have to review these uploads, so we ask you to please do everything you can to make them legible and well organized! We very much desire you to upload multipage scans as a single pdf! This greatly reduces the number of files the volunteers have to open to do their jobs. Sure, one person’s waiver in two uploads means opening just one extra file, but multiply that by the scores of active Permanents riders SIR has and one less mouse click per job really matters! This also helps prevent the digital equivalent of dropping a file of loose papers. For iPhones and iPads, you can use the Notes app: https://www.theverge.com/2017/9/26/16362386/apple-ios-11-notes-document-scanner-how-to-use). You can also take pictures and combine them into one pdf. But do this only if you know how to set your camera to its highest resolution and adjust the exposure for good legibility. If you are using a phone or tablet, please place the documents in good light without shadows, and hold the device as level and square as possible over the documents. Review your images. If they are blurry or not turned the right way up, please correct the problem. Please do not try to scan or photograph two letter-size pages in one image. Doing that compromises legibility. Some phones and tablets may display a scan or photo the right way up, but include incorrect orientation data that causes the image to be displayed sideways or upside down on other devices. If you can, please download a test image to a computer to check for this problem before you upload scans to the Perminator. In light of the clamor to take advantage of the current good weather, and the willingness of several volunteers to process paper registrations, SIR’s Permanents are available via emailed registrations. Download, fill out completely, sign, scan and return the ride registration. If you use your phone or tablet to photograph the registration set the camera to its highest resolution, take the picture under good light, and ensure it is focused, legible, and includes the entire document. The Permanents volunteers who review the registrations have final and unappealable authority to reject unsatisfactory registrations. We will make every reasonable effort to approve applications, but the volunteers lead real lives so please apply with as much lead time as possible. Quick processing is not guaranteed. Do not pester the volunteers with queries asking if your request was received. If you do not receive approval by your requested start time, you may of course exercise your free will to ride as you please, but you will not be riding under the auspices of the Permanents program and you will not receive credit for your ride. Email your completed registrations to permanents@seattlerando.org . Include “Ride request” in the subject line. If approved, you will receive an email with the card and route sheet. 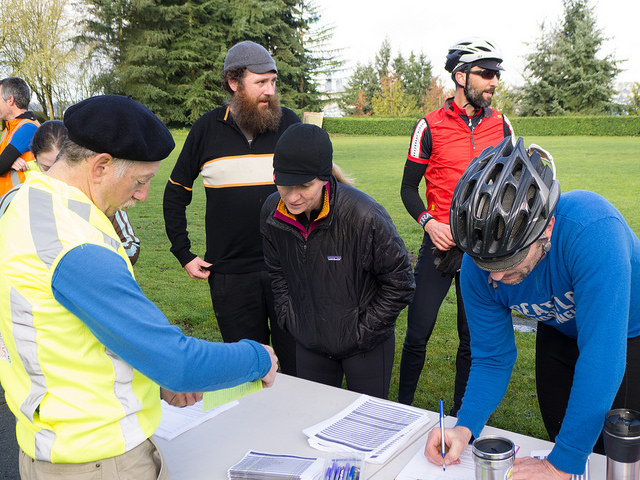 After your ride, snail mail your signed card and the original registration to: Millison Fambles, 3520 Sunset Beach Dr NW, Olympia WA 98502. We regret to announce SIR’s Permanents are suspended currently due to the Perminator’s infelicitous demise. Permanents will be reinstated when the new Perminator is available. In case the new Perminator is not running by next weekend, we are considering having several Permanents volunteers lead group Permanents requiring signed paper waivers. The Permanents volunteers are discussing whether to take on the workload involved in handling paper waivers. As some of you have likely noticed, Perminator is offline and has been for a bit. It suffered a serious failure related to changes in an external service. The data is accessible but Perminator can’t talk to it. Fixing the existing Perminator would require addressing a chain of breaking changes and EOLed components in its dependencies that have accumulated over it’s the 3+ years of operation. The result would likely still be brittle and require replacement soon. As the volunteer developer of Perminator, I need to balance the clear value of Perminator with the cost to maintain and run it. I’ve been working on and off on a replacement for Perminator for a while. Recently I switched gears to Perminator v3, which was designed to be substantially more robust and easier to maintain for the long term. I made the judgement call after Perminator v1’s failure that the time spent temporarily fixing v1 would be better used completing v3. I consulted with SIR leadership on this decision and have been pursuing that path aggressively since—aided by the crappy weather, but constrained by some family issues and lack of access to good coffee or beer. Perminator v3 is almost complete and is already being debugged by some alpha testers. We hope to make a public version of it available within the week. Beyond replacing Perminator v1, this new version is more maintainable, more robust, simpler to use and more powerful. In particular, it puts the pieces in place for near term introduction of alternate starts and EPP (Electronic Proof of Passage). That said, despite my efforts, Perminator v3 will not be ready for this weekend. Further comments are disabled. Please respond or post questions on Facebook or the SIR email list.